The Kuiper Belt is an area of ​​the solar system where according to astronomers there are remains of the primordial solar system so their study can offer new information on the formation of planets and other smaller objects. NAOJ’s press release calls it Edgeworth-Kuiper Belt, a variant that also takes into account the contribution of Kenneth Edgeworth, who hypothesized its existence already in 1943. According to the most supported theory, planets and smaller objects were formed through a progressive growth starting from the dust that originally formed a protoplanetary disk. Far from the Sun those materials remained more scattered and, in spite of various hypotheses and researches, there’s at present no certain evidence that there are planets beyond Neptune while there may be many dwarf planets and smaller objects in considerable amounts. At those distances from the Sun the chances that those objects have been altered over the last billion years are much lower than the asteroids in the inner solar system, where not only are there greater probabilities of collisions but solar radiation can have much greater effects, especially on frozen compounds. That’s why Kuiper Belt Objects (KBOs) are so interesting and the mission of NASA’s New Horizons space probe is so exciting. So far, it performed a dwarf planet Pluto flyby and recently flew by the object dubbed Ultima Thule, an asteroid that’s already quite large since the length from the ends of its two lobes is around 45 kilometers. However, the theory predicted that there were planetesimals, objects with a radius around one kilometer, and now it seems that one of them has been discovered. The survey called OASES (Organized Autotelescopes for Serendipitous Event Survey) carried out by Ko Arimatsu’s team uses two amateur telescopes installed on the roof of a school on the Japanese island of Miyako. About 2,000 stars were observed over a total of 60 hours in the hope of discovering an occultation, the technical term to describe in this case the passage of an object in front of a star. Analyzing the data, the team discovered a slight decrease in brightness of one of the stars observed compatible with the passage in front of it of a Kuiper Belt Object with a radius of about 1.3 kilometers. Ko Arimatsu explained that his team had only a small budget available, less than 0.3% of the budget of large international projects. Despite this they managed to find a really small planet. If this discovery is confirmed, it’s a confirmation of the existence of objects with a radius close to the kilometer, a missing link in the history of the solar system formation. 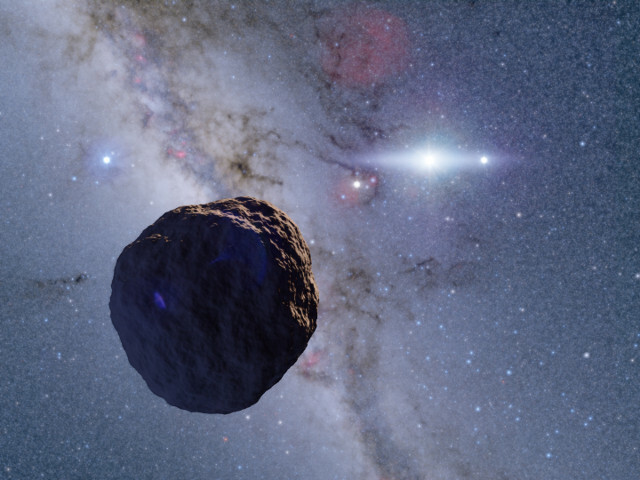 The researchers will continue to monitor the Kuiper Belt with the hope of discovering more objects that might be even more distant, up to the Oort Cloud.